After the second month on month decline in the seasonally adjusted series, industrial production in Singapore is now 3.9% lower than it was a year ago. As recently as July, Industrial production in Singapore was running at 23.3%YoY in July 2017. 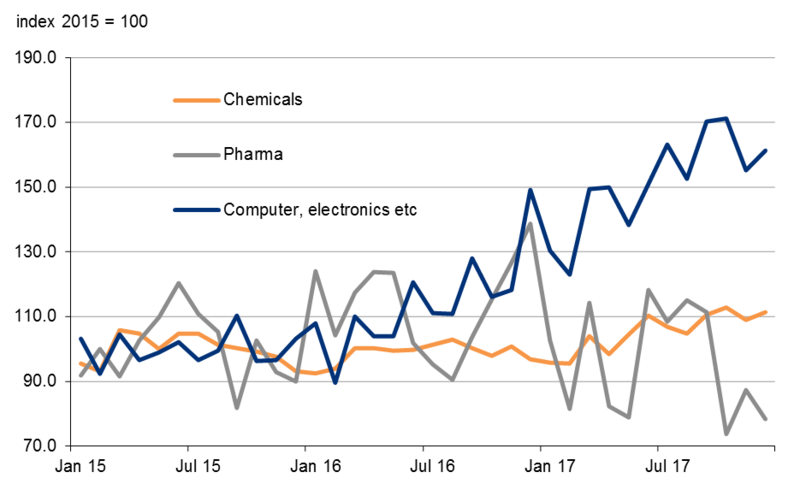 When production was accelerating during 2017, electronics were in the driving seat and dominated the headline figures for production. Two things have now happened. Electronics growth has slowed - both a function of less supportive base effects, but also a genuine slowdown in the annualized rate of monthly production. Meanwhile, pharmaceuticals growth, which had not been particularly strong during the earlier part of 2017, actually began to stage outright declines. If it were just industrial production, it wouldn't be so bad, but the indicators of household spending have also been on the soft-side, though admittedly retail spending picked up sharply in November. Non-oil domestic export growth has fallen to only 3.1%YoY, down from over 20% back in October. Inflation is low and showing few signs of picking up - although the Monetary Authority of Singapore is only forecasting a range of 0-1% inflation for 2018, so this is not yet a massive cause for concern. With this fairly consistent picture of mediocre growth and very limited inflation, we are feeling very uncomfortable with our forecast for some monetary tightening from the MAS at their April meeting. If they don't move by then, they will likely have to wait until the October meeting, which seems a long time to wait. But April is getting nearer, and the run of data currently is making that call look overly optimistic.